Whether you're a tradie or an office worker, nothing tastes quite so refreshing as a hard-earned beverage after a long day's work. A few drinks on a Friday is a great way to catch up with friends in the city, or bond with colleagues. From old-school pubs to classy cocktail joints, Sydney's CBD has it all. There are options for every budget and preference, and I reckon I've sampled a pretty broad spectrum. Then, last Friday, I discovered something completely new - the Happy Hour Cruise. On the first Friday of every month, Rosman Ferries takes a 2 hour trip around the harbour. Pitched at locals, this cruise is more like a floating pub than a tourist attraction. Friendly and fun, with a band in the background, and reasonable drink prices. The whole thing is fantastic value at just $15 a head, with your first drink thrown in. My partner and I had a great time making friends with other passengers, and just watching the world go by. The ship provides a wonderful diorama of the harbour's beautiful scenery. As the sun went down, and the stars started twinkling above, the dance floor got bopping. It's worth giving them a call to book - just to be on the safe side. Then, be at the Commissioner's Steps in Circular Quay right on time. Departure is at 5.30pm sharp, so aim to get there by 5.15pm. 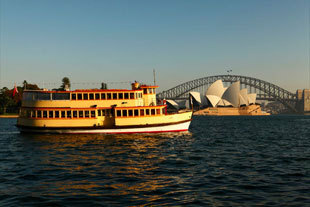 You'll arrive back at Circular Quay around 7.30pm - just in time to seek out dinner.